Neuroimaging study shows disrupted networks in the brain of dyslexic readers. Dyslexia, the most commonly diagnosed learning disability in the United States, is a neurological reading disability that occurs when the regions of the brain that process written language don’t function normally. The use of non-invasive functional neuroimaging tools has helped characterize how brain activity is disrupted in dyslexia. However, most prior work has focused on only a small number of brain regions, leaving a gap in understanding of how multiple brain regions communicate with one another through networks, called functional connectivity, in persons with dyslexia. This a team from Yale University to conduct a whole-brain functional connectivity analysis of dyslexia using functional magnetic resonance imaging (fMRI). They report their findings in the current issue of Biological Psychiatry. The team compared fMRI scans from a large number of both children and young adults with dyslexia to scans of typical readers in the same age groups. Rather than activity in isolated brain regions, the researchers looked at functional connectivity, or coordinated fluctuations between pairs of brain regions over time. In total, they recruited and scanned 75 children and 104 adults. The team then compared the whole-brain connectivity profiles of the dyslexic readers to the non-impaired readers, which revealed widespread differences. This study illustrates the value of functional imaging to map circuits underlying problems with cognition and perception, in this case, dyslexia. This is one of the first studies of dyslexia to examine differences in functional connectivity across the whole brain, shedding light on the brain networks that crucially support the complex task of reading. Compared to typical readers, dyslexic readers had weaker connections between areas that process visual information and areas that control attention, suggesting that individuals with dyslexia are less able to focus on printed words. Additionally, young-adult dyslexic readers maintained high connectivity to brain regions involved in phonology, suggesting that they continue to rely on effortful ‘sounding out’ strategies into adulthood rather than transitioning to more automatic, visual-based strategies for word recognition. Whole-brain connectivity differences between groups. 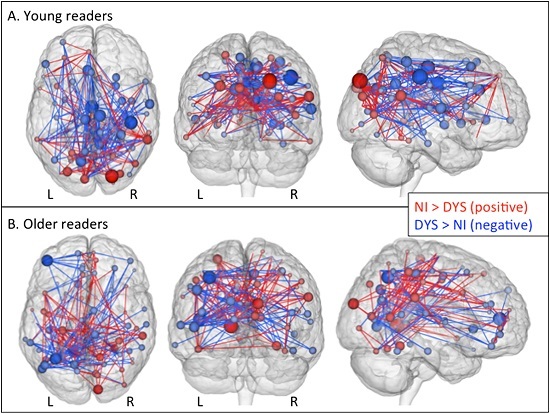 Three-dimensional representation of the nonimpaired readers (NI) > dyslexic readers (DYS) (“NI”) and DYS > NI (“DYS”) edge components (p < .01 after network-based statistic correction) in young readers (A) and older readers (B). Red lines denote the NI network; blue lines denote the DYS network. These components were thresholded for scarcity to show nodes with a sum of edges differences ≥ 15 in younger readers and ≥ 10 in older readers along with all the nodes to which these suprathreshold nodes were connected, representing approximately 1% of the total number of edges in both age groups. Spheres are placed at the centroid of each node and are scaled and coloured according to their numbers of edges in the NI and DYS networks (i.e., large red nodes have many more NI edges than DYS edges, and vice versa for large blue nodes). Note that all figures are shown in neurological convention (subject-left is image-left): axial views are top-down, and coronal views are from the posterior. L, left; R, right. Finn et al 2014.